Ref 130 ?Yellow? Patek Philippe & Cie, Genève, No. 867160, case No. 650075, Ref. 130. Made in 1947, sold on March 23, 1948. 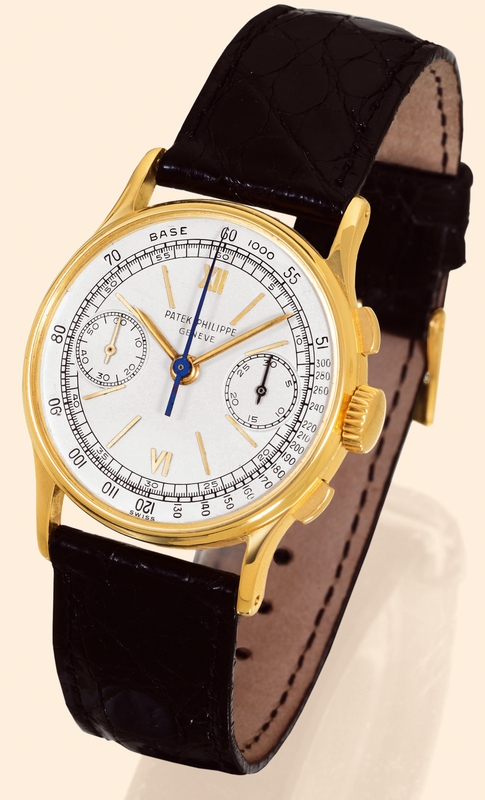 Very fine and rare, 18K yellow gold gentleman's wristwatch with square button chronograph, register and tachometer. Accompanied by the Extract from the Archives. C. Three-body, solid, polished and brushed, concave bezel and lugs. D. Matte silver with applied yellow gold baton indexes and Roman numerals, subsidiary seconds and 30-minute register dials, outer tachometer graduation, concentric, 1/5th second scale. Yellow gold "bâton" hands. M. Cal. 13-130, rhodium-plated, "fausses-côtes" decoration, 23 jewels, and straight line lever escapement, monometallic balance adjusted to 8 positions, self-compensating Breguet balance-spring, micrometer regulator. Dial, case and movement signed. Diam. 33 mm. Thickness 11 mm. C. Three-body, solid, polished and brushed, concave bezel and lugs. D. Matte silver with applied yellow gold baton indexes and Roman numerals, subsidiary seconds and 30-minute register dials, outer tachometer graduation, concentric, 1/5th second scale. Yellow gold "bâton" hands. M. Cal. 13-130, rhodium-plated, "fausses-côtes" decoration, 23 jewels, and straight line lever escapement, monometallic balance adjusted to 8 positions, self-compensating Breguet balance-spring, micrometer regulator. Dial, case and movement signed. Diam. 33 mm. Thickness 11 mm.